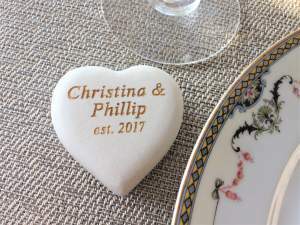 Personalized to reflect sentiments of love, joy or concern, these natural stone and sea glass hearts are perfect for weddings, celebrations or to hold the memory of a loved one close. Coordinating the stones with your event or mission is simple with an array of text and color options. As part of our Premium Collection, our custom heart stones feature more consistent sizing, deeper engraving and arrive individually wrapped. Select from the soft creams, pinks, greens and grays of natural stones or bright yellows, blues, greens and purples of sea glass. You’ll have room for short sayings or images and the option to engrave the backside as well. Begin by selecting the preferred size and material for your engraved heart stones, then determine the colors, font and text. Whether it’s for a private event or an organization, these unique pieces will say what’s in your heart.